Staff at an engineering firm where up to 270 jobs could be axed have returned to work. Leicestershire-based Brush Group sent workers home on Thursday, saying it planned to reduce its generator manufacturing capacity because of declining demand. MP Nicky Morgan said "the whole of Loughborough" was behind those facing redundancy. Workers are due to find out later whether their jobs are safe. Staff returning to work at the factory's Nottingham Road site, which has employed generations of workers, spoke to the BBC earlier. One, Tom Williams, said: "Everyone's very upset because there's a lot of people that will have lost jobs in what's the biggest place in Loughborough so moving to another job will be difficult really." Another called the news "disgusting". Image caption Loughborough MP Nicky Morgan said the decision is a "shock"
Tony Burke from Unite said: "Defending employment is our number one issue, making sure that those people that want to continue in employment are able to do so. "We're looking at retraining opportunities, looking at maybe transforming the company. "We're not in the game of walking away, shrugging our shoulders and accepting it." Brush CEO, Chris Abbott, said the firm had suffered from a "major structural shift" in the market and its production of its two-pole turbo-generator has a "critical shortage of orders". Conservative Loughborough MP, Nicky Morgan, said: "They're highly skilled, highly trained, very experienced, but of course there's a huge emotional shock. "I hope that everyone knows the whole of Loughborough is on their side." 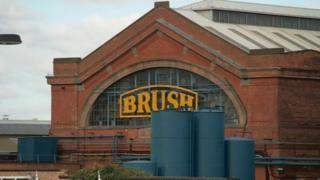 Formed in 1879, Brush supplies products to electric power industries both on and offshore and employs 790 people across the UK. The firm said the decision to restructure its generator manufacturing capacity would not affect its other facilities in Wales and Derbyshire.